While walking through the woods Saturday afternoon, I came upon a patch of vibrantly green wintergreen plants adorned with red berries. The diminutive plant adds a nice touch of green amid the greys and browns of the forest floor. 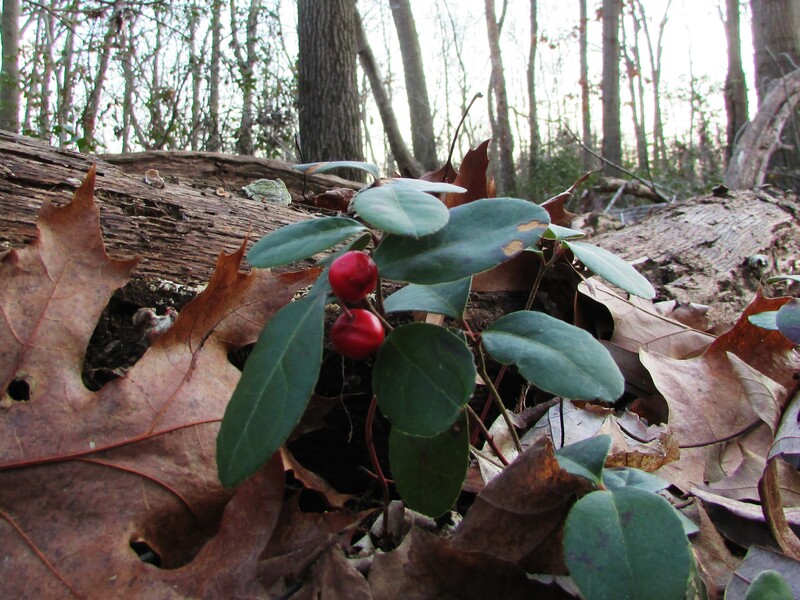 Wintergreen can be identified by its easily recognized fragrance. The minty flavor of wintergreen is popular in gum and candy. * Care must be taken in the use of wintergreen. Taken improperly, or in large doses, the plant is toxic. We used to do some chemistry experiment with oil of wintergreen- can’t remember what now. I used to wonder what winter green was at that time. You’re welcome Susie! I hope the start of your week is lovely. I was surprised to learn, while researching for the post, that the essential oil of wintergreen is full of the same substance as aspirin(form of salicylate) and in even small amounts, orally or through the skin, wintergreen oil can be fatal. You are right- now I remember my chemistry experiments or was it biochemistry- in medical school- I can’t remember but how did you know it was this plant ? I can’t remember exactly, but I used to press a lot of plants from the woods and probably noticed the smell. A computer is also great for looking up identification for plants.